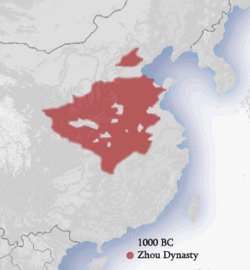 ↑ فینگہاو is the modern name for the twin city formed by the Western Zhou capitals of Haojing and Fēngjīng. ↑ The exact location of Wangcheng and its relation to لوویانگ is disputed. According to Xu Zhaofeng, "Chengzhou" and "Wangcheng" were originally synonymous and used to name the same capital city from 771 to 510 ق م. "The creation of a distinction between Wangcheng and Chengzhou probably occurred during the reign of King Jing", under whom a new capital "Chengzhou" was built to the east of the old city "Wangcheng". Nevertheless, the new Chengzhou was still sometimes called Wangcheng and vice versa, adding to the confusion.